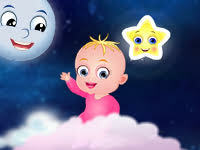 "Star Light Star Bright" is an English nursery rhyme for kids. It is a rhyme with a single stanza and was first published in the late nineteenth century. The poem is associated with a superstition of making a wish on seeing a shooting or falling star. The rhyme is also found in Madonnaâ€™s 1983 single lucky star. "Star Light Star Bright" and tradition is believed to be known in Britain by the early 20th century and have since spread in every corner of the world.